Steam boiler manufacturer, CFB BOILERS reports it has launched a budget-friendly reverse osmosis unit, the BoilerRO, which is capable of achieving almost 100% purity of boiler feedwater for superior quality steam. Designed in Britain by CFB Boilers, the BoilerRO is said to cost around half that of many comparable units, making reverse osmosis accessible to steam boiler users that may previously have found the technology to be price-prohibitive. The company says this market game-changer is suitable for a wide range of commercial and industrial applications, including those within the medical, pharmaceutical, food and beverage industries. 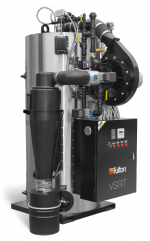 FULTON says its all-new gas-fired, vertical spiral-rib tubeless steam boiler, the VSRT, is the first range to emerge from the company’s new ‘PURE Technology’ approach, an initiative that has resulted in a world-first design that is durable, long-lasting and boasts the highest efficiencies and ultra-low NOx emissions as standard.